Yesterday after Camille's morning ballet class, we went to Aldi. I typically like to save my BIG shopping trips for days that she's in preschool, but (le sigh) we were nearly out of coffee and you know what that means. Time to hit.the.store. So, I spent $103, which -- at Aldi -- basically means that I bought the entire store. That amount right there is what I like to spend a week on groceries for our family, so hopefully we won't have to go to the store any more this week. I don't abide by a hard and fast budget for groceries, but I know the ballpark range of where I like to be. I did get a lot, and in the picture above it doesn't show the two bottles of wine that I already stuck in the fridge to chill (priorities, people) and the mesh wastebasket that I got for $3.99 to put under my little sewing desk. 1// Organic pasta sauce. I like having a jar of marinara in our fridge at all times. We are not huge pasta eaters, but occasionally I'll make it for Camille. You know, when I feel like cleaning red sauce from our walls. 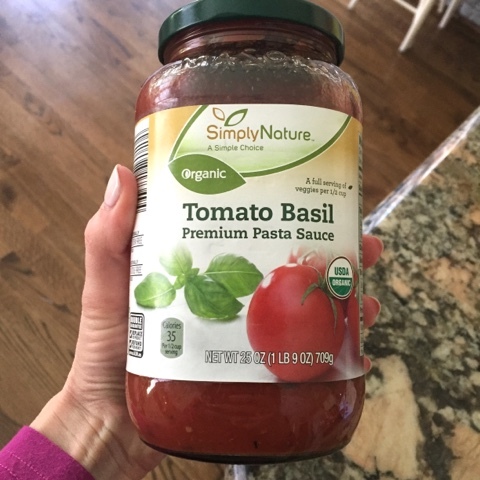 :) But this is just a great fridge staple because you can top chicken breasts with marinara and shredded cheese and bake them, or we can make little mini-pizzas for Camille on English muffins, or we can dip our Friday night pizza crusts in little bowls of it. Tomatoes are definitely high up on the "dirty dozen" list, so for that I do like to buy organic as much as possible. This large jar is $1.99. 2 // Organic baby food pouches. I mean, you can spend $1.50/pouch on organic baby food at the grocery store without even trying. These bad boys are $0.79/each, friends! Completely organic. You can NOT beat that price! I bought 18 of them yesterday. 3 // Whole pineapples. This one was $1.89 yesterday but Aldi often offers them for $0.99. Even at almost $2, it's a steal. 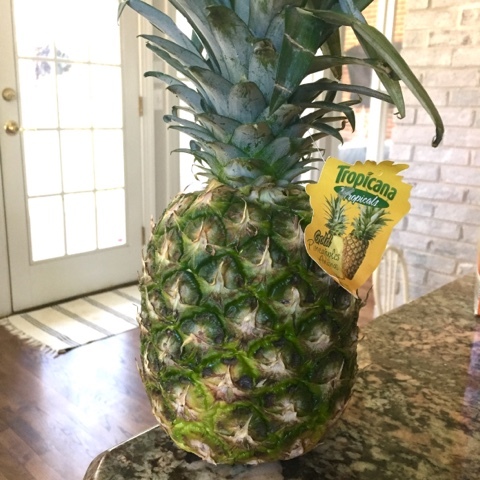 Have you ever paid for a large container of fresh pineapple? Yeah, it's like $7/$8. All you have to do with this is take a large knife, lop off the top, slice down the sides, and then cut down around the core. Chunk it up, put it in a tupperware. 4 // Fiber bars. These were $1.49 and they are the perfect mid-morning snack! 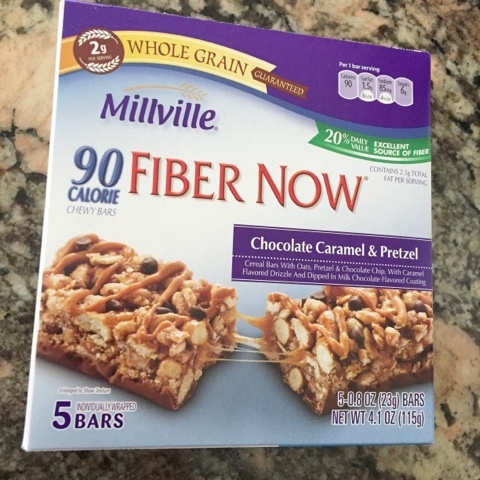 When I had gestational diabetes with Charlotte, I would buy the protein-added fiber bars and they always helped me stay within my perfect glucose reading range. 5 // 100 Packets of sweetener. We use this for coffee and a 100 pack box is $1.59. 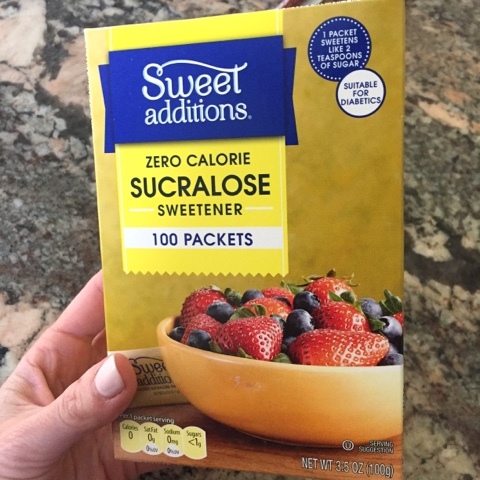 If you've bought Splenda packets at the grocery store, you know what a deal this is! 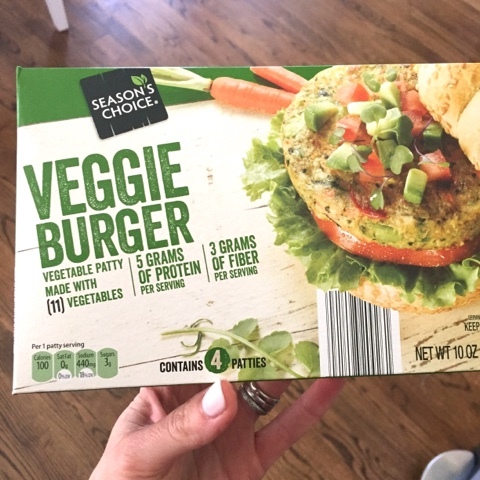 6 // Frozen veggie burgers. These are $2.49. I love them for lunch on a toasted English muffin, and I can also cook one for Camille and she loves it for dinner! Last night for dinner we had a crockpot roast (I used a pouch of Campbells slow cooker tavern roast sauce that I got at Aldi for $1.99 and a 2.5lb bottom round roast, also from Aldi, for $7.45). It was delicious. I served it with the mashed cauliflower bake we do all of the time and roasted cabbage and carrots. The cabbage ($.69/head) and carrots were just tossed in some olive oil and steak seasoning. It was such a delicious meal that was hearty yet healthy! Other favorites that I bought yesterday -- four-packs of easy mac shells and cheese that were on BIG sale for $.69 (YES for all four cups! ), two boxes of cereal that were $1.99/each, coffee pods that are $3.99 for a box of 12, a bag of frozen boneless chicken breasts for $5.99, Ritz knock-offs for $1.59 for the box. Oh, and the kale citrus salad that we love that is $2.99 and has all of the toppings and dressing included. Can't beat it. Hit me up with some of your recent Aldi finds below! 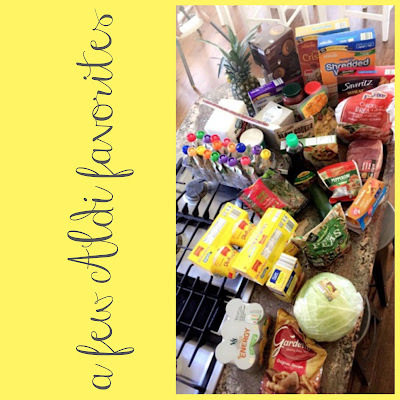 And, to see more of my favorites as well as my shopping tips for Aldi, visit THIS post. I finally went to Aldi this past weekend and was floored. There are a few things they don't have that I have to run to Wegmans or Trader Joe's for, but yes-Aldi is it for the most part. Although we are getting a Lidyl(spelling?) soon and I'm curious how that will be. I love love Aldi! Their wine (the white with the bicycle on the label is my favorite! ), produce and cheese board items are the bomb to name a few! Question -- have you tried all of the meats from there? I have cooked the chicken breasts and the thin pork chops and thought they were fine but my husband insisted something wasn't right about them! He knew they were from Aldi so maybe he was just paranoid. Have you had any bad experiences with the meat? We buy Aldi chicken breasts and the 93% ground beef and find it just as good if not better from the meat we get at other chain grocery stores. We just had an Aldi open up in our area and I'm so excited to visit! Buy a pineapple corer. You will thank me later :) We love Aldi! My mom recently got gelato from Aldi and it was INSANELY delicious. She got mixed berry and pistachio and they were both really, really good. It's definitely worth checking out! I love Aldi! Their diapers have been a great find for us. Best price around, no fragrances or irritants. They arr perfectly absorbent for daytime but we do use name brand diapers for overnight. Love their sparkling water, Naan, Cibatta buns, and chocolate. Good to know about the diapers! You are making me want to go to Aldi's! An Aldi is opening up close to us this Thursday and I'm so excited! I plan on doing the bulk of my grocery shopping there because I hate the amount we spend currently! You know how much I love this post! I'm going to have to snag some of those veggie burgers for NB. Love that kale salad too... have you tried roasting it?? Pour the greens on a sheet pan, and top with olive oil, balsamic, salt and pepper. Roast at 375 for 10-15 minutes, then toss in the toppings. Serve sans dressing. It's our favorite!! I love Aldi for their organic ground beef! At ours the fruits and veggies are hit or miss so I usually have to go somewhere else also. Their cans of beans are a staple for us, along with the no added sugar pasta sauce. I have yet to get that steak seasoning but it's definitely on my list! I always buy Lilli's food pouches at Aldi! So much cheaper for the same thing everywhere else! I also love to buy their frozen chicken. It's half the price at Aldi!! I definitely need to check ours for those veggie burgers. Such great finds! I always get overwhelmed and don't know what to buy... these are some great ideas. LOVE Aldi! 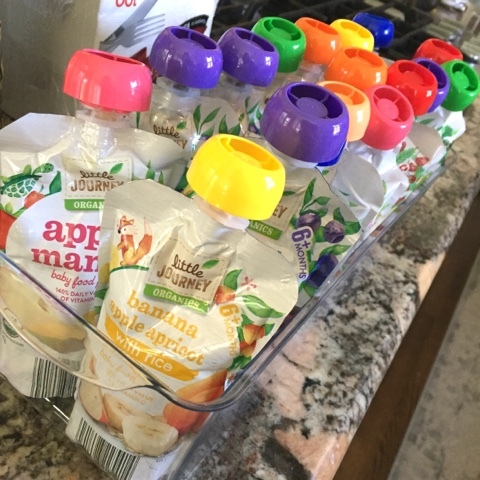 I also buy the organic pouches and applesauce pouches and my kids love their yogurt pouches, yogurt tubes and almond milk! Their diapers, pulls ups and wipes get the job done too - at a fraction of the cost! I am a paper towel snob (love Bounty but not the price) but their brand is VERY comparable. Their string cheese and hummus are also my favorite! I could go on and on over my love for Aldi! We just started frequenting Aldi again when started a six food elimination diet for my son's food allergy. Their gluten-free selection and prices make it hard to compete with! Great choices! Ok I guess I'm going to have to go! All my friends love it. I just can't seem to get on board. Probably Bc I always forget my own bags!! My boys are both going to school today so I'm going to give it a go!! Taking your shopping tips and tricks with me!